Benoit Schryer Lefebvre is the youngest son of Julie Schryer and grew up surrounded by traditional music. He plays fiddle and tenor banjo, sings and also plays tin whistle, mandolin and guitar. Benoit started to play the tin whistle at 5 years of age and fiddle at 7. He has learned from some of Canada’s finest fiddlers (Shane Cook, Mark Sullivan, Pierre Schryer, James Stephens, and Dan MacDonald) while on the road touring with his mom and as a student at the AlgomaTrad Music, Dance, and Heritage Arts Family Camp. In 2012, Benoit spent a month studying traditional music in Ireland as part of his secondary school co-op program. Benoit has attended AlgomaTrad since its inception in 2004, has performed with the family band throughout Ontario, Quebec and Michigan for the last 13 years, and was part of the “Schryer” concerts at Shelburne and Chelmsford in ’07 and ’09 that featured his mom and uncles, Pierre, Louis, Dan, and Raymond Schryer. Benoit performs regularly with his family group, The O’Schraves, including performances at the Blissfest Music Festival and with the Sault Symphony Orchestra and tours in the USA, Ontario, and Quebec. The O’Schraves were Northeastern Ontario regional finalists for the CBC Searchlight Contest with their song, Little Log Cabin, recorded on the 2014 O’Schraves CD release “Family Day”. In 2014, the group was awarded New Emerging Artist Award by liveireland.com and Best New Group from the Chicago Irish American News for 2014. Benoit studied violin at the Sault Symphony School of Music and at the Algoma Conservatory, has won numerous awards at the Sault Kiwanis Festival, and has competed in many fiddle competitions. In August of 2010, Benoit was invited to perform in the Junior Showcase at the Canadian Grand Masters Fiddle Competition in Ottawa. 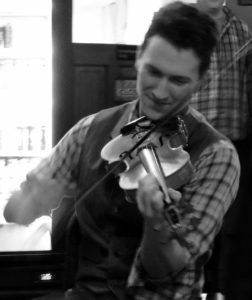 In 2011 and 2012 he placed first in the 18 and under class at the Pembroke Fiddle and Stepdance Contest, arguably the premier contest for Ontario fiddlers outside of Shelburne. In 2015 he came 2nd at Pembroke in the Open finals – all the other finalists were past Canadian Grand Master Champions. Benoit has performed with the Brian Pickell Band and Shane Cook and Troy MacGillivray. He also performs with the stellar contra/square dance band, “Ladies Chain”, with Eli Howard and Colin Savoie-Levac. He also performed with his brother, Zach, in the folk trio, Wildwood Soul, with singer/songwriter Lorissa Scriven.